The legendary Lacy/Waldron duo recorded live during their first British tour, playing the music of Duke Ellington and Thelonious Monk as well as that of Waldron and Lacy. This disc contains the whole of their concert at the Oxford Playhouse Jazz Festival on 16th May 1993. REPRINT OF THE LEGENDARY CD ORIGINARY ISSUED BY SLAM PRODUCTIONS IN 1993, THIS IS A LIMITED EDITION - COLLECTORS' ITEM 999 NUMBERED COPIES! VOTED AMONG THE TOP 5 REPRINTS BY THE MAGAZINE "ALL ABOUT JAZZ NEW YORK"
There are many reasons why today's listeners will enjoy this CD. First of all, the fact the original recording of these two master-musicians had been released in 1993 by an independent label (Slam Productions of musician and producer George Haslam) is an important message to all audiophiles, because it demonstrates that 'Indies' are able to focus on Art instead of business opportunities. The fact that now Silta Records, another independent label, is re-issuing the CD is coming from the wish to spread this great music to a wider and renewed audience. This is again reflecting the spirit of the original release: to allow all listeners to enjoy the music that came out of that great night of May 16th, 1993. The second reason is that the concert Lacy and Waldron made in Oxford more than 15 years ago is an important document, witness of the artistry of these two magic American musicians. Today's listeners have now the chance to live the deep experience of attending a concert of these two masters, with an excellent audio quality. Furthermore, this re-issue is peculiar because it is a collectors' edition - the print in fact is limited to 999 numbered copies and this is another factor that makes this CD really special. Among all these good reasons, one is primarily important: this Music is magic and emotional! 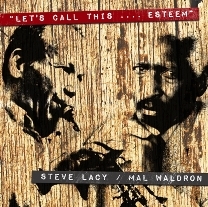 Saxophonist Steve Lacy and pianist Mal Waldron perform with great interplay, melting their musical ideas with pathos and with their melodies. The repertory is driven by the unique compositions of Thelonious Monk, on which Waldron is showing his strong personality and his ability to develop the original harmony while Lacy's melodic lines enrich the improvisations with modern ideas and his always personal sound. The set had been beautifully completed with compositions of Waldron and Lacy themselves plus an unforgettable ballad by Duke Ellington: it really looks like that evening the two wanted to remind where the roots of modern Jazz are, showing at the same time towards which direction modern Jazz is evolving!